Stories Without Words (the subject heading to use if you’re ever searching for them in a catalog) are great tools for emerging readers, reluctant readers, story times, and all kinds of programs. I love them because I’m a visual person, and sometimes the absence of words makes these books feel much more poignant to me. So this is the latest booklist I’ve made. The first couple of books are my absolute favorites, then I’ve added the complete booklist I compiled. The ones with an * link to whole posts I wrote about them. 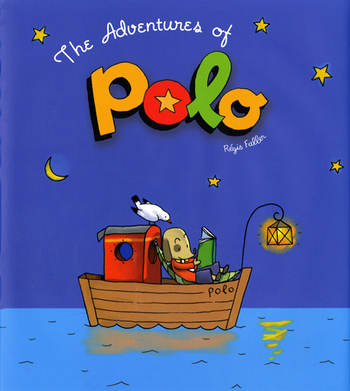 The Adventures of Polo by Regis Faller (2006). This French book introduces us to Polo the dog, who steps out of his front door and embarks on a long journey where he flies, sails, climbs, and gets lots of help from new friends he meets along the way. It is whimsical and full of imagination, the kind of story kids will return to again and again. The illustrations are simple and gorgeous, and while I think it’s too long for a single lesson or program, it has a lot of potential for parent/child reading and maybe a unit on imagination and resourcefulness. 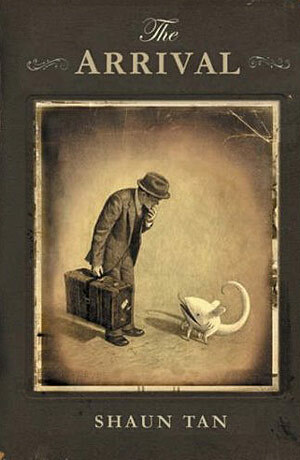 The Arrival by Shaun Tan (2006) is a work of art. This surreal and moving story of a man who immigrates to a foreign land to make a better life for his family is beautiful and strange. Shadows of dragon-tail like shapes haunt the home and family he leaves behind. Wondrous creatures, a language of symbols, and strange machines greet him in his new country, bringing the reader in to the feeling of isolation and frustration. He meets new friends and learns how to survive in this new place. This is not only a powerful story of immigration; it’s also a beautiful fantasy. A series of wordless scenes zooms out, revealing that each scene is a small part of a bigger scene. Also check out Banyai’s Re-Zoom. Briggs, Raymond. The Snowman. New York: Random House, c1978. In this classic story without words, a young boy builds a snowman who comes to life for a night of big adventures. Carle, Eric. Do You Want To Be My Friend? New York: Harper Collins Publishing, c1976. A little mouse asks the question and then is rejected by lots of big animals until he finds just the right friend for him. Carmi, Giora. A Circle of Friends. New York: Star Bright Books, 2003. When a young boy does a good deed, it comes back to him from new friends. Cosentino, Ralph. The Marvelous Misadventures of Fun-Boy. New York: Viking, 2006. A nearly wordless book of stories about a little boy with a big imagination. dePaola, Tomie. Pancakes for Breakfast. San Diego, CA: Harcourt Brace, c1978. A little old lady wakes up thinking about pancakes for breakfast, but she is out of eggs, milk, and maple syrup. But she perseveres until she gets those pancakes! Faller, Régis. The Adventures of Polo. New Milford, CT: Roaring Book Press, 2006. A truly wonderful story about a dog who leaves his house one day and goes on an incredible journey with lots of friends. Fleischman, Paul. Sidewalk Circus. Cambridge, MA: Candlewick Press, 2004. A sign advertises the circus is coming to town, but a young girl waiting for the bus sees amazing circus-like feats from regular people all around her. Franson, Scott E. Un-Brella. New Milford, CT: Roaring Brook Press, 2007. A little girl has a magic umbrella, an “un-brella,” that makes the opposite weather happen around her whenever she opens it. Geisert, Arthur. Hogwash. Boston: Houghton Mifflin, 2008. All the little piglets have played and gotten dirty, but their mothers have created a giant cleaning machine to get them all cleaned up. Geisert, Arthur. Oops. Boston: Houghton Mifflin, 2006. When some milk is spilled while the pigs have breakfast, destruction follows until it destroys their house! Lee, Suzy. Wave. San Francisco, CA: Chronicle Books, 2008. A young girl plays with the waves at the beach. Lehman, Barbara. Museum Trip. Boston: Houghton Mifflin, 2006. A young boy is separated from his class during a field trip and is magically transported into a world of mazes. Lehman, Barbara. Rainstorm. Boston: Houghton Mifflin, 2007. A lonely boy who lives in a big house finds a mysterious key one rainy day that leads him to adventure and new friends. Lehman, Barbara. The Red Book. Boston: Houghton Mifflin, 2004. A girl finds a magical red book in the snow, and when she looks inside she finds a doorway to another place. Lehman, Barbara. Trainstop. Boston: Houghton Mifflin, 2008. A young girl takes a train ride and discovers wonderful things along the way. McCully, Emily Arnold. Four Hungry Kittens. New York: Dial Books for Young Readers, 2001. Four kittens get into mischief while looking for food on the farm. McCully, Emily Arnold. School. New York: HarperCollins, c2005. A curious little mouse, too young for school, sneaks into the classroom to see what school is like. Newgarden, Mark. Bow-Wow Bugs a Bug. Orlando: Harcourt, 2007. A curious dog sees lots of unexpected things when he spends the day chasing a bug around his neighborhood. *Rogers, Gregory. The Boy, the Bear, the Baron, the Bard. Brookfield, CT: Roaring Book Press, 2004. A boy playing in modern London kicks a soccer ball into an old theater. When he follows it, he travels back in time Shakespeare’s day and has a very dramatic adventure. Tan, Shaun. The Arrival. New York: A.A. Levine, 2006. A man leaves his wife and child behind to move to a new country and make a better life for all of them. Great for middle and high school students, the story is set in a fantasy world where the struggles of being in a foreign land are made clear and poignant. *Varon, Sara. Robot Dreams. New York: First Second, 2007. This wordless graphic novel, great for older students, tells the story of a lonely dog who buys a robot to be his friend. After a tragic trip to the beach, the dog and the robot learn about friendship, regret, and forgiveness. Weisner, David. Flotsam. New York: Clarion Books, 2006. A young boy finds a washed-up underwater camera on the beach. When he develops the film inside, he finds incredibly pictures and a little bit of history. Weisner, David. Tuesday. New York: Clarion Books, 1991. On Tuesday night, hundreds of frogs fly away from the farm on lily pads, causing a night of excitement. Weitzman, Jacqueline P. and Robin P. Glasser. You Can’t Take a Balloon into the Metropolitan Museum. New York: Dial Books for Young Readers, 1998. A little girl and her grandmother go for a visit to the Met Museum, but she is told to leave her yellow balloon tied to a banister until she leaves. When the balloon gets loose, the museum guard chases it all over Manhattan. Weitzman, Jacqueline P. and Robin P. Glasser. You Can’t Take a Balloon into The National Gallery. New York: Dial Books for Young Readers, 2000. This time the little girl, her little brother, and their grandmother go to the National Gallery, and the balloon gets loose in Washington, D.C. There is another book in the series, You Can’t Take a Balloon into the Museum of Fine Arts.